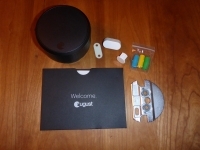 The new lock also comes in new packaging that is slightly smaller than the Gen. 2 lock. 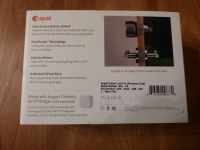 The front of the new packaging shows a picture of the lock and references the Z-Wave Plus, Bluetooth and Apple Home Kit connectivity. 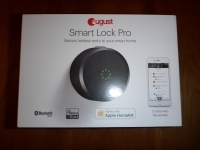 The back of the box lists a few features like auto-lock/unlock, DoorSense, activity history and virtual keys. On one end of the sleeve you will find a reference chart to which types of locks it can work with, requirements to set up and operate the lock as well as a list of contents. The other side again references some of the features of the lock. Removing the sleeve you will find a black flip top box that houses the lock and all of its accessories. In side you will find the lock on the left side and in various slots on the right you will find additional accessories. Included with the lock you will find two options for DoorSense setup, adapters for various types of locks and the mounting plate for the lock. Since the majority of the lock appears to be the same (from the outside) I will just touch on what is new with this lock and that is the DoorSense sensor. 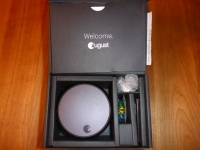 Straight out of the box the sensor is mounted in the white oval shaped holder with the screws already in the assembly. If you choose to use this holder you have two options for mounting; screws or double stick tape. Since this DoorSense sensor needs to be placed close to the lock I really didn't want something protruding from my molding figuring someone would bump into it and knock it off. So that leads me to your other mounting option and that is recessed in your frame using the included cap. To utilize this you need to take the sensor out of the oval holder and double sticky tape it to the cap.